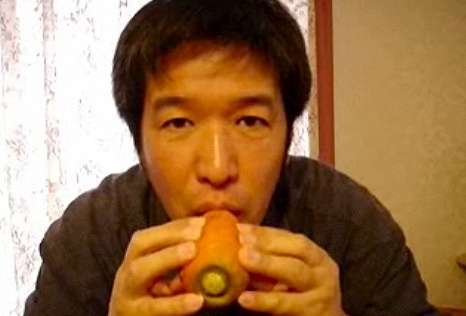 The World Carrot Museum has discovered several groups of people who make, and then play, musical instruments from Carrots (and other vegetables and fruit). Heita3 Make a Kazoo Bejing Brothers Sound Matters London Vegetable Orchestra Carrot Love Song Any more? 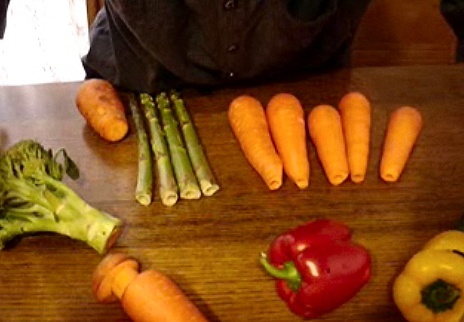 Here are some of the instruments that can be made out of vegetables: A carrot and a bell pepper makes a horn. A pumpkin can become a drum with tiny eggplant, squash or carrot drumsticks. 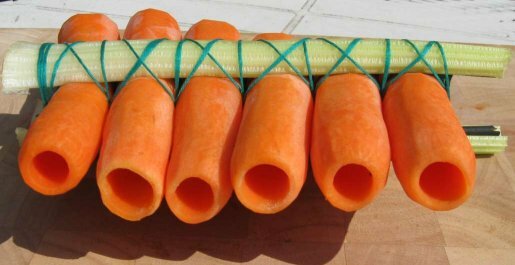 Carrots of various sizes with holes drilled into them can make panpipes, flutes, recorders and clarinet-like instruments. Leaks can be transformed into a violin. Celery can be used to transformed into a guitar thanks to its fibrous composition. What is Flutenveg?? It's Kerry Fletcher and Alain Thirion from Perth in Western Australia who make musical instruments out of carrots and other vegetables. You had better believe it, you can even see and hear them playing on their web site at Flutenveg com - carrot musicians. Kerry and Alain have just come back from a Festival South of Perth in a town called Esperance where they have the annual "Festival of the Wind" The carrots were a huge success. They had some 30 people walking in the parade blowing three different notes - C,E,G chord - in single pipes carrots whilst Kerry and Alain improvised on a full set - 12 notes - carrot panpipes. Sounded great as well as the munching sound at the end of the playing! They are also known as Bella Music and tour all the music festivals and do a lot of work in schools - they must be a truly amazing site when in full swing. They also do a first class job in promoting healthy vegetable eating. Good on ya! Flute 'n' Veg can also enhance corporate functions, Stress Management Workshops and team-building events. Is there no end to this talented bunch? 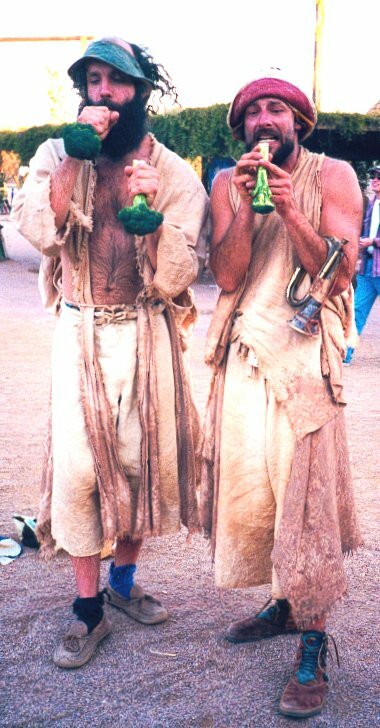 To quote from their site "From corporate functions to festivals across Australia these finely tuned and sculptured carrot instruments a peel to all ages! 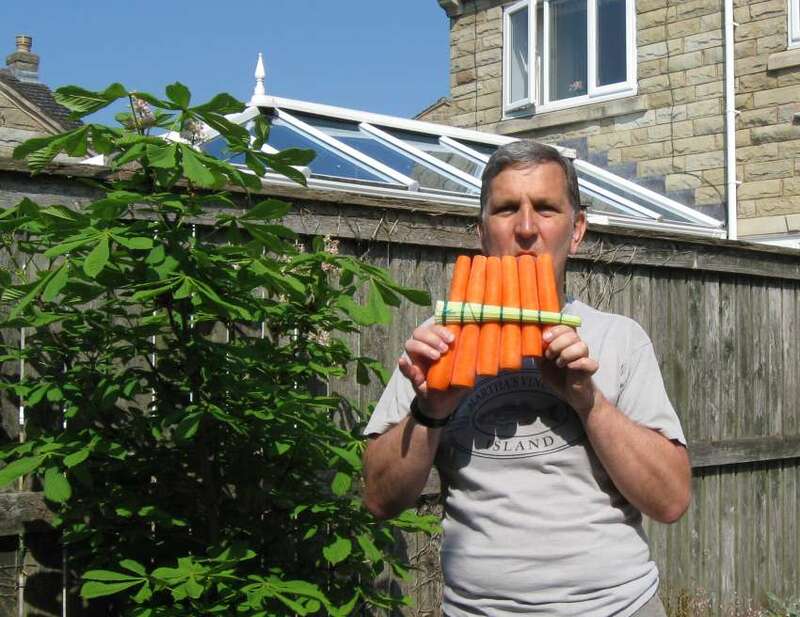 Tuned carrot panpipes can be made to create massed harmonies followed by carrot munching. Editor's note: Flutenveg is now defunct as the musicians have gone their separate ways. How do they make the musical instruments? With lots of time and patience! Selecting them at the various local supermarkets can be time consuming. Long ones are best - between 15 and 25 cm - not too thin, at least 4 cm in diameter at the thick (leafy) end and as straight as possible (makes drilling not too tricky!). In an ordinary kitchen it takes about 3 hours to make a full set of panpipes - 12 notes. Another 2 to 3 hours to make the flageolet and quena flutes. In all a full day's work at the office! Sometimes 2 depending how many are required (Duo or quartet) Once finished they are wrapped in very wet tea-towels and kept in the fridge until performing time, carrying them in a cool "hand portable fridge" (called esky). The fresh celery addition happens minutes before the performance followed a fine tuning session with the piano accordion using mung beans to slightly raise the pitch if necessary. They are pre-tuned at 440 Hz whilst making them, with a electronic tuner. They need refreshing - with the aid of a squeeze bottle - regularly throughout the performance to keep them moist, so that they don't dry out (easier to play) and look fresh at all times. As you can imagine they are very demanding! Why going through all that bother for instruments that after all only last the time of one performance? The smiles and joy - astonished looks and comments - from young ones to seniors listening attentively is so rewarding and thus worth the effort of making them. Or maybe simple, gentle madness! The tools specifically created and designed for the job, were made by Kerry's partner who is a luthier of international reputation. He specialises in the making and restoration of ancient wind instruments. So there you are, you know just about all the "secrets" of the trade! Surely another fine example of carrot madness. Keep it going Bella Music. When John visited Alain in Belgium he kindly made some one off pieces to show how it is done. Here are the results. Here's a guy who can do incredible things with a simple carrot. When Linsey hits the stage expect the unexpected! What does he do?? he plays carrots - Yes!! combining comedy with music making, and generally giving people a good time. He is a home-styled kitchen hand with a difference. He’s eccentric, hilarious and totally irresistible. And he lives in a musical world where all is possible.... From the moment that he walks into the kitchen, everything becomes musical. He even transforms a carrot into a clarinet before our very eyes. Using digital technology to record sounds instantaneously the audience is able to see each piece being constructed layer by layer, with all the sounds coming from the cooking utensils and food. This musical world that Linsey creates is more than a series of clever tricks. It is an aural world of depth, energy and beauty. Although the materials are disconcertingly simple, the music itself is complex, rich and emotive, ranging from energetic and percussive cross rhythms to haunting and lyrical woodwind (or should we say vegiewind) melodies. Linsey Pollak is an artist with a reputation for not only creating, but also playing instruments made out of everything from carrots, watering cans, chairs, bins and brooms to rubber gloves. For over 30 years, he has toured in Australia, Asia, the Americas and Europe. Linsey is well known all around Australia as a musician, instrument maker, composer, musical director and community music facilitator. He has worked as a musical instrument maker for over 20 years and has designed a number of new wind instruments as well as specialising in woodwind instruments from Eastern Europe (having studied Macedonian bagpipes in Macedonia). He has specialised in designing and making marimbas and other tuned percussion. His ongoing obsession combines much of this: Making music more accessible to the Community through musical instrument making and playing workshops. Linsey has a reputation for making and playing instruments made from rubber gloves, carrots, watering cans, chairs, brooms, bins, and other found objects. First developed in his solo show “Bang it with a Fork” and further in the acclaimed children’s show “Out of the Frying Pan”, this line of musical inventiveness has ultimately led him to also encompass modern digital technology and develop his solo shows “Knocking on Kevin’s Door” , “Playpen”, “The Art of Food” and "Making Jam" and the larger scale outdoor environmental performance “Bim...BamBoo! !” More recently he is using a midi wind controller to play and loop samples of everything from voices to frogs. He is currently building a musical installation where the sound of frogs are triggered when large aluminium frogs are hit with a stream of water “SQUIRT”. Linsey Pollak is one of Australia's most brilliant and under-rated composer/musicians. He is wildly innovative in the use of instruments but never lets his experimentation get in the way of the musicality of a work. 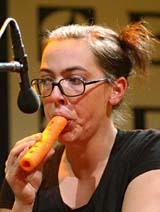 Queensland’s Linsey Pollak makes music from carrots and other household items, such as watering cans and camping stools. 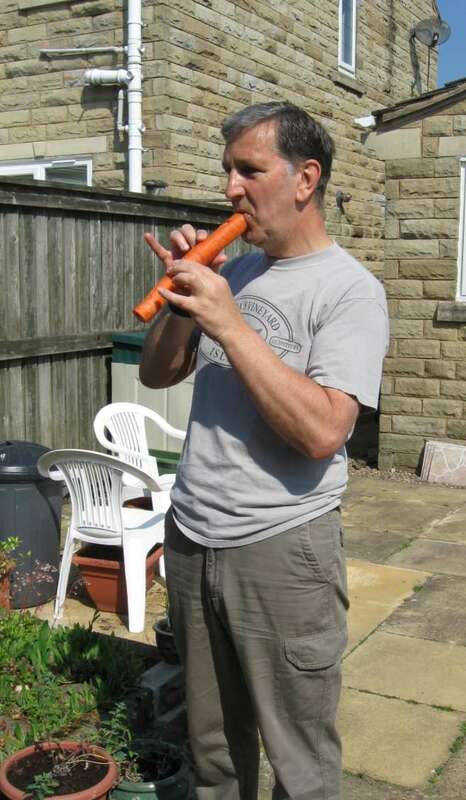 Here’s how he makes a carrot clarinet. Cut the carrot to 187mm. For the thumb hole at the back, mark a spot 22mm from the tip (the thinner end). For the finger holes on the opposite side of the carrot, mark holes at 39mm, 54mm, 74mm, 97mm, 123mm and 140mm from the top. 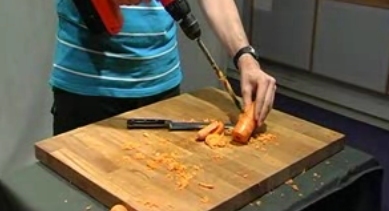 Drill a hole all the way through the length of the carrot with a 12mm drill bit. Blow out shavings. Use a 7mm drill bit to drill thumb and finger holes, only drilling through to the hole in the middle. Clean up the front of the thumb and finger holes using a vegetable peeler so they are easy to see. Join an alto sax or clarinet mouthpiece to the top using a short length of 12mm tube, such as hose joiner. 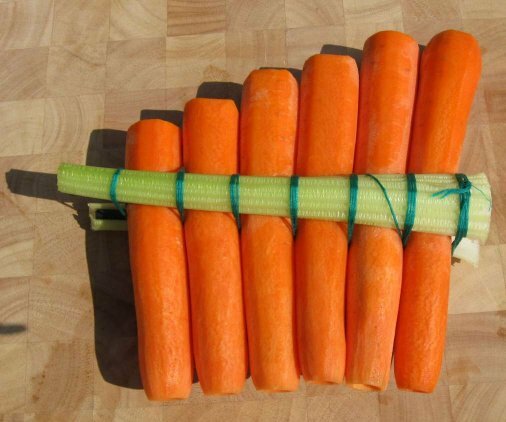 If adding a funnel, cut the thicker end of the carrot so the finished length (excluding mouthpiece) is 187mm. Another method for making the carrot clarinet here, compliments of Classic FM. Listen to Cowboy Jack Clement singing "Drinking Carrot Juice! - Youtube video - https://mail.google.com/mail/u/0/?tab=wm#inbox/154cc220ebb28256?projector=1. 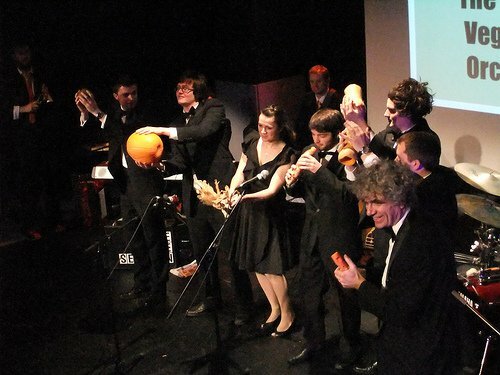 The Vegetable Orchestra was founded in 1998. It consists of 11 musicians, a sound engineer and a video artist. Based in Vienna, the Vegetable Orchestra plays concerts in Europe and Asia. From time to time workshops are given - on how to manufacture an instrument or on musical topics. Carrots are hollowed out and made into recorders that sound strikingly similar to the plastic kind; onions are pulled apart and the skins rubbed together to make a subtle crunch; big pumpkins become bongos. There are no musical boundaries for the Vegetable Orchestra. The most diverse music styles fuse here - contemporary music, beat-oriented House tracks, experimental Electronic, Free Jazz, Noise, Dub, Clicks'n'Cuts - the musical scope of the ensemble expands consistently, and recently developed vegetable instruments and their inherent sounds often determine the direction. Of course like all the carrot musicians the World Carrot Museum has come across, these people are very serious about their music - it is not a "just for fun" project. The Vienna Vegetable Orchestra makes it cool to play with your food. There isn't anyone else in the UK that does what they do. 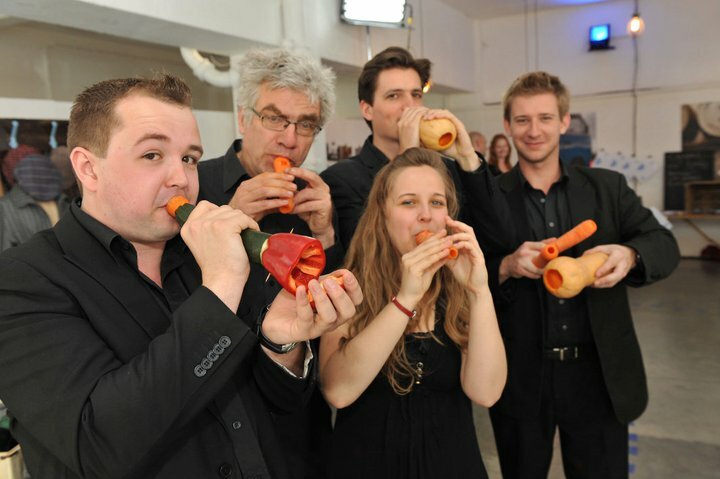 The London Vegetable Orchestra performs on instruments crafted using fresh vegetables! Master instrument maker Tim Cranmore has joined forces with a collection of the UKs leading orchestral, jazz and popular musicians to create an innovative fusion of vegetables and music! They play music entirely using instruments expertly carved and fashioned on the day of performance using fresh vegetables! For example, recorders made out of carrots, and blow butternut squashes like bugles. Sweet potato percussion Courgette trumpet with red pepper mute Two tone carrots & squash pitched percussion Enjoy some of the music and videos here. Dan Woods and Jo Stephenson are Can You Dig It?Musical comedians currently touring the country with the show Can You Dig It? which is all about trying to grow your own and allotment life. It is inspired by the fact both the participants have allotments and are making feeble attempts at cultivating vegetables - as well as some of the characters they have met along the way. It includes a love song to Alan Titchmarsh, a rap battle between a gardener and a slug and a Eurovision number inspired by BBC Radio 4's Gardeners' Question Time. They are keen to include vegetable instruments in the show and were inspired by some of the other musicians featured in the Carrot Museum, especially Heita and the Vegetabl e Orchestra of Vienna. 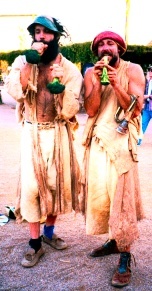 Dan plays the cucumber trumpet and carrot panpipes in the show and Jo plays the hosepipe tuba. They also do workshops showing others how to make vegetable instruments. Here is their website where you can read about our adventures and listen to some of the songs from the show - Visit their web site here. There is a CD of 16 songs about growing your own vegetables, which you can purchase. The Can You Dig It? 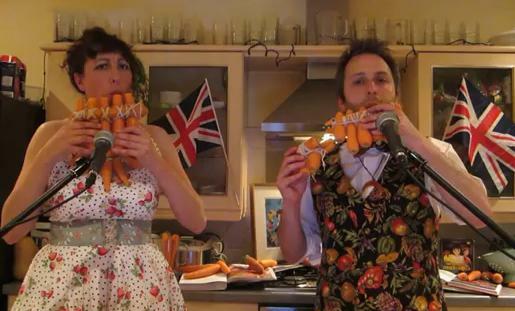 crew recently won the "Carrot Olympics", a competition run by the British Carrot Growers' Association and performed the theme tune to 1980s children's cartoon The Mysterious Cities of Gold on carrot panpipes and carrot ocarina - youtube video here - http://www.youtube.com/watch?v=wNo1yBApVy4. Can You Dig It? 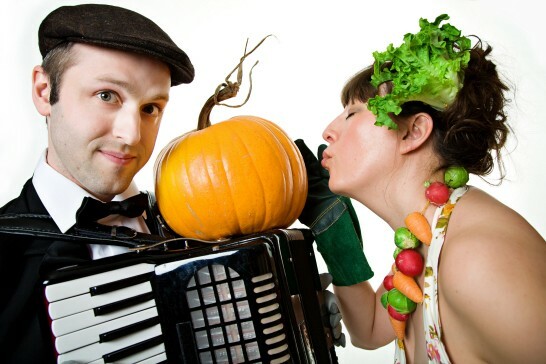 premiered at the Edinburgh Fringe Festival in August 2011 at the Royal Botanic Garden Edinburgh and the duo have since taken it all over the place from Devon and Somerset to Berwick-upon-Tweed. A Vegetable Orchestra featuring a renowned violinist and music students playing instruments carved from fresh broccoli, eggplant and carrots. The Long Island Vegetable Orchestra (LIVO), has actually created some funky instruments using vegetables such as carrots, potatoes, pumpkins, cucumbers, lemongrass and bamboo sticks. And this unique veggie jam is definitely a delish musical salad making all kinds of right noises. According to the band's official website, the group was founded in 2011 at the C.W. Post Campus of Long Island University. "LIVO was created by Grammy-nominated music professor, Dr Dale Stuckenbruck, who investigated carving musical instruments out of vegetables," reads the introduction. 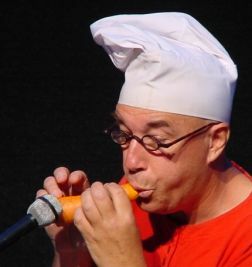 LIVO performs with freshly prepared instruments such as a saxophone-like “cucumberphone”, pumpkin bass drums struck with lemongrass, various carrot flutes, delicious daikon double reeds, butternut squashes that carry the sound of brass instruments, sweet potato ocarinas, natural clarinets and bamboo violins. 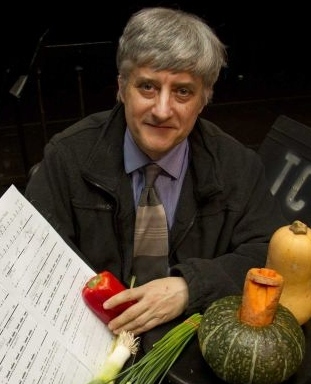 On March 30, 2011 the Long Island Vegetable Orchestra performed a brief experimental musical composition - a four-minute, original classical piece called "Carrots and Strings" - a feast for your ears - not on ears of corn, but on cucumber, radish, eggplant and green pepper, with a solo or two on carrot. In the tradition of the Vienna Vegetable Orchestra, which has received hearty acclaim for its performances and produced a cornucopia of CDs. The concert featured music students led by Adjunct Professor Dale Stuckenbruck, a renowned violinist and concert master of such Broadway shows as “Promises, Promises,” “Jekyll and Hyde” and – yes – “A Catered Affair.” But it was the produce which topped the bill. The orchestra is really more of an ensemble made up of four high school vegetable players and Stuckenbruck, accompanied by a violin, a viola and a cello. Afterward, they eat their veggie instruments, so there's no waste, Stuckenbruck says. "My daughter, she made a carrot cake," he says. Stuckenbruck also has made soup. "If you cook it at really hot temperatures, it's servable to other people," he says. The watermelon hull and veggie skins are contributed to a compost pile on campus, he adds. Ask music teacher Dale Stuckenbruck his favourite instrument, and it's quite possible he'll say "the eggplants." Rub two together and they make a squeaking sound like sneakers on a gymnasium floor, or a monkey chanting "ooh ooh ooh," he says. A close second might be the carrot. Carve it into a recorder-like instrument and it carries a flutelike melody. Then there's the watermelon. Hollow it out and thump it with lemongrass stalks and it offers a drumbeat. Put them together and you've got what Stuckenbruck has dubbed "The Long Island Vegetable Orchestra," . Stuckenbruck, who teaches violin and is also a music teacher at the Waldorf School, a private school for preschool through 12th grade in Garden City. It was while teaching there that he launched a vegetable orchestra to teach students "everything around you in life can become a musical instrument." Stuckenbruck got the vegetable orchestra idea from the Viennese Vegetable Orchestra, which was founded in 1998. An orchestra in Vienna was asked to do an experimental performance at a festival and decided to make music from the toughest items they could think of -- soup ingredients. For his Long Island version, Stuckenbruck goes shopping before rehearsal at Chinese and Korean vegetable markets and at Whole Foods, and he also gets donations from C.W. Post. Stuckenbruck might be in the produce aisle, looking at a bunch of celery stalks to see whether rubbing the leaves together makes a rushing sound like the wind. Or tapping the watermelons to see if the shell is hard enough to play. It costs $200 to $300 in vegetables to rehearse four times, do a sound check session and perform, he said. The microphone check is a key element of preparation, so the vegetable sounds can be heard. The instruments have to be created as close to the performance as possible, and won't last more than 24 hours because they dry out. 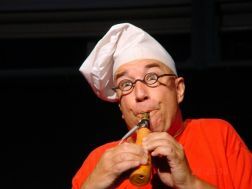 At a recent rehearsal on a Thursday night at Stuckenbruck's West Hempstead home, the group made instruments in his backyard, using an ice-cream scoop to hollow the watermelon, a handheld, motorized drill to tunnel through the cucumber and the carrots, and a paring knife to carve embouchures, or mouthpieces. Max Cheney, 15, is a Waldorf sophomore from Glen Cove, and he made a trumpet-like instrument from a cucumber, a carrot and a red bell pepper. Orin Pearce, 16, is a sophomore at Waldorf from North Woodmere who usually plays the drums; it was a natural transition for him to take on the watermelon. "With the drums, there are a lot more options," Orin says, such as striking the cymbals. "Here you are more limited, so you have to be a lot more creative." Stuckenbruck's daughter, Erin, 16, is a junior and she plays the carrot alongside her dad. Rehearsal involved reading off regular musical scores with measures and notes. It's a challenge to keep it going -- Erin's carrot, for instance, was getting soggy and wouldn't play. Stuckenbruck is no stranger to unusual musical performances. He was nominated for a Grammy for playing the musical saw, and he also plays the wine glasses. The veggie group is slated to perform again at C.W. Post when summer classes are in session in July. Says Stuckenbruck: "These are the concerts these kids will remember 50 years from now. 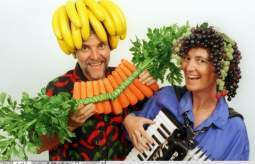 Dr. Cranius Lunch, Seth Sethstherton and Grebe, are more commonly known as the Wyld Men, specialising in Veggie Music - ye s music played on real vegetables! Think of it as ‘precycling’. Before you use something, you use it for something else first -- in this case, parts of your next meal. Read on, follow the links and engage your imagination! The Wyld Men are three like minded artists who perform and experiment in the realms of music, theatre and movement. The "Veggie Music" CD is an exploration of song styles, soundscapes and radio theatre featuring the use of flutes made out of vegetables and other inventive sources of music. In this recording you will hear such instruments as Yam, Broccoli and Carrot Whistles as featured on the album cover. 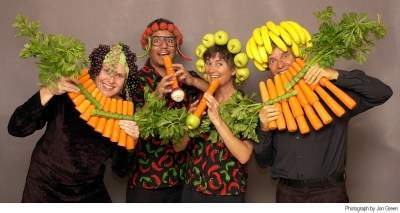 They have found in live performance that they must be able to create their instruments on stage, or no one believes that they are really vegetables. While it is technically possible to create a fingered fife or flute from, say, a carrot, this is an exacting, tedious and lengthy process – and one at which they are not at all accomplished. The solution is to quickly create musical vegetables by drilling them out, then assembling a number of these vegetables creates, in effect, a set of pan pipes (no pun intended, though they are all ultimately destined for the pan. When playing the street at a festival the Wyld Men like to claim that we are the only musicians out there guaranteed to go home to supper). Wyld Men's own page in the Museum here. 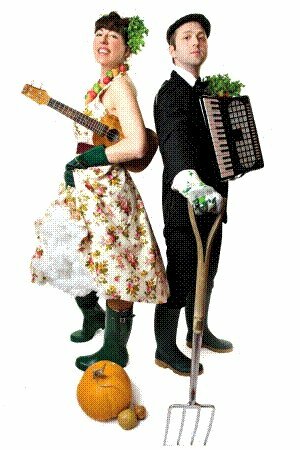 Described as "A playful and eclectic melange of diverse musical styles, comedy and theatre using flutes made out of vegetables as well as experimental instruments such as the umbrella-phone and a whiskey-in-the-jar-o-phone." - it is great music and great fun! 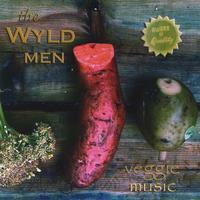 The Veggie Music CD gives the band ample opportunity to share the tunefulness of tubers. Seth's My favourite veggie cut (which is making more and more ipod downloads!!) is Location 5, an ode to David Brubeck'' Take Five. The guitar man Frank is awesome, David (Grebe) performs some monstrous percussion, and Seth (Douglas) is very sassy on the beet, yam and broccoli and Jonathan explores the unexplored on slide potato. The whole CD is beyond expectation - give it a listen here - and let the jaw slacken just a little, the eyes widen and allow that laugh to start way down deep in the belly. To read the tales of Jonathan Crocker ( Dr Cranius Lunch) and Douglas Mumaw's (Seth Sethstherton) here. Although Wild Carrot are not strictly "carrot" musicians, they clearly have a link to carrot world as they are known to give out wild carrot seeds at their performances! Carrot Pam Temple and Spencer Funk of Wild Carrot met through music, married and began performing full-time together in 2000. 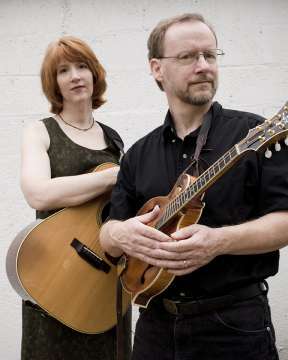 They were quickly voted “Best Folk Act” in their hometown of Cincinnati and have since crisscrossed the country pleasing audiences with their eclectic mix of award-winning original songs, traditional tunes, swing, blues and more, being chosen twice as the only U.S. Folk Act to serve as Cultural Ambassador to Chile, South America with the U.S. State Department. When they’re not performing, Spencer is also a respected guitar teacher and Pam, on-air music host of the American Roots program, The Front Porch, at local NPR affiliate 89.7FM WNKU. Wild Carrot is also available as a trio (Wild Carrot Trio) or quartet (Wild Carrot with Their Roots Band) to fit your venue's needs and budget. The latest CD from Wild Carrot (with Their Roots Band) was recorded live with an audience and is called Crowd Around the Mic, on their own Chocolate Dog Music label, released through Blue Jordan Records. It was truly grown from the ground, funded almost entirely by the audiences and donations from fans. So, where did they get the name "Wild Carrot'? A wild carrot is the same as Queen Anne's Lace. Their music has been described as being rooted in the solid earth of tradition and untainted by commercialism; strong while displaying a delicate intricacy, like Queen Anne's Lace. Nan Weidong and Nan Weiping -Two brothers in Beijing have come up with an alternative use for roots, tubers and gourds. Nan Weidong and Nan Weiping have refined the art of fashioning musical instruments out of vegetables. The idea of playing music with vegetables came to Nan Weidong, 43, and Nan Weiping, 41, only two years ago, but it has since become a passion and a career. The brothers learned to play conventional instruments from their father, a music teacher, when they were children. Now the pair live and work in a narrow apartment in Beijing, drilling holes in carrots, marrows, lotus roots and Chinese yams to make vegetable instruments that they perfect using an old electronic tuner. They now live and work in a narrow Beijing apartment, drilling holes in carrots, marrows, lotus roots and Chinese yams and nibbling silently on the shavings all the while. A sweet potato becomes a perky ocarina, a bamboo shoot a mellow, reedy flute. 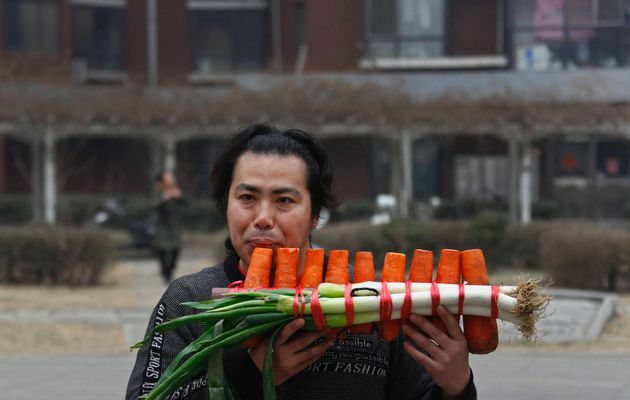 A row of carrots tied upright to leeks is transformed into a set of Chinese panpipes. According to the brothers, different vegetables have different scales and are therefore suited to different melodies: a sweet potato makes an ocarina, a bamboo shoot becomes a flute, a yam, a whistle. But controlling the pitch is still extremely difficult, because changes in the air temperature, humidity and other factors can warp the shape of the holes and put the notes out of tune. Nan Weidong explains that picking the right vegetable at the right time is essential. "If the water content in vegetables evaporates, the tune will become higher than the basic tune or go out of tune. Therefore we choose the vegetables with as much water content as possible. The vegetables have to be solid and hard. We can't use those vegetables left over for days. They are too soft to be played." The deeper the hole, the lower the pitch. The shallower the hole, the high the pitch. Besides, the size of the hole also matters to guarantee the quality of the sound. The leeks only serve as decoration. It was made based on the principles of how Chinese panpipes work. Of course vegetables have a shelf life, so each show requires a brand new set of carrot and leak panpipes and potato ocarinas. Growing Sound is a cross-curricular workshop, for primary and secondary schools, that uses making musical instruments from fruit and vegetables as the focus for exploring music, the physics of sound, plant biology and the environment. Read more. Ingredients - 1 Medium to large carrot; 1 Kitchen Knife; 1 Drill; 1 Longish drill bit, say 15mm, long enough to drill a hole lengthways through the carrot. A small piece of greaseproof paper. 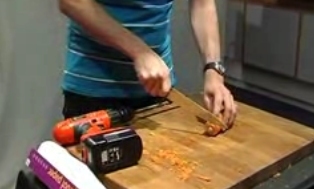 Method: Make a cut across the carrot to create a flat end to drill into. 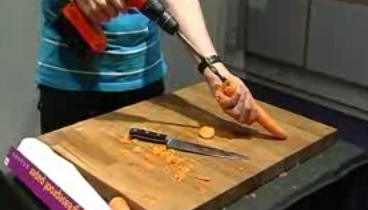 Carefully drill a hole through the carrot lengthways. Check you can sing or talk down the carrot. If you can’t, the hole is probably blocked or not big enough. Drill another large hole from the side of the carrot into the centre of the bore. Cover the side hole with greaseproof paper and lightly hold in place with your fingers around the edges. Start singing ... The key to this instrument is to find the frequency the paper wants to rattle at, so experiment with singing at different pitches. You might need to fiddle with the paper to get it to work. It should be covering the hole so it gets moved by the air, but not so tightly held that it can’t rattle. You can hold the paper in place with your fingers or elastic bands, but this must not be on top of the hole, otherwise you stop the paper moving.